For F Palavendran, the recent collision of a fishing boat with a merchant ship off the coast of Kerala that led to the deaths of three Kanyakumari fishermen was all too familiar. “Four years ago, I survived one such collision,” says the fisherman from Manikudi. Palavendran lives in the same neighbourhod as Arunkumar who is among the nine of the fishing boat Oceanic crew still considered missing. Of the nine missing, seven are from Kanyakumari. Munambam near Cochin is a popular fishing spot for many Kanyakumari fishermen. 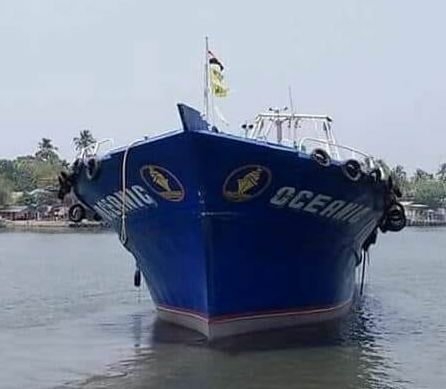 Either they have their boats there or join hands with Kerala fishermen. . “The Arabian Sea is rich in fishes and it is our source of livelihood,” says K Alexander, president of the Kanyakumari unit of Tamil Nadu Fish workers federation. The area also lies in among the busiest shipping lines in the world with ships bound for and to West Asia and Europe transiting through. Kanyakumari fishermen. This means there is always a persistent danger of life-threatening collisions. The most recent one was apparently with Desh Shakti, which, at nearly 1,60,000 tonnes, is among the biggest ships owned by the Public Sector Undertaking Shipping Corporation of India. Last June, an unidentified ship collided with a fishing boat and one fisherman died but 11 were rescued. The accident happened at around 2:30 am, say fishermen. The Oceanic collision likely happened at around 4am. Similarly, fishing boat Carmel Matha was damaged when a Panama registered ship collided with it early morning and the fishermen were left struggling in the water. After two hours, there were rescued by another boat Saint Anthony. Coast Guard seized the merchant ship that apparently tried to flee. Most collisions seem to happen past midnight. It’s a time when fishing boats drop anchor and fishermen take some time off to sleep before spreading their nets just before daybreak. It is a time they may switch off any light that can help to mark the boat out for passing merchant ships. Palavendran recalls: “The ship was west-bound and so were we. When we were close, we turned our boat towards the ship by mistake and the collision happened.” The merchant ship stopped and their crew ensured that no one was hurt before proceeding, says Palavendran, adding that he stopped going to the sea after the accident. “It is the responsibility of the merchant ships crew to avoid collisions,” says Soosai Anthony, a merchant navy captain of Kanyakumari. On merchant ships, the time between midnight and 4 am is often called the graveyard watch – when sleep can lull the senses of the hardiest of seamen. “But it is the responsibility of the merchant ships crew to avoid collisions. They have sophisticated navigating equipment including radars. They have charts and voyage plans that mark out areas with heavy fishing activities,” says Soosai Anthony, a merchant navy master of Kanyakumari. Anthony adds that today merchant ships have begun to hug the coast a lot more so their homesick crew can get mobile phone access and they can get connected. This increases the danger of collisions with fishing boats that are found closer to the coast, he adds. Anthony recommends that fishermen who are experts in their craft can be trained in modern seamanship regarding the use of navigation lights and other collision avoiding exercises. He also advocates the use of modern equipment. Fishermen association leader Alexander asks that wireless radio be made available on fishing boats near Cochin so there is communication. National Fishworkers Forum president M Ilango says central and state governments should take steps to improve communication between fishing boats and shipping authorities who should ask merchant ships to avoid the coast. “We will consult experts and take steps to avoid such collisions,” says Kerala fisheries minister Mercykutti Amma. This topic contains 0 replies, has 1 voice, and was last updated by Nandha Kumaran 8 months, 2 weeks ago.